KoKo Locker Ransomware is probably one of those programs you would never want to find on your computer. However, if you have been infected with this ransomware, you will have to deal with it ASAP. This malicious infection tries to push you into spending your money for a decryption key that may not even work. In fact, it would be for the best to remove KoKo Locker Ransomware right now and then restore your files from some system backup. Please do not succumb to the cyber criminals’ demands because that would not solve anything. On the contrary, you would only get into deeper trouble. It is very likely that this ransomware entered your system as a spam email attachment. Spam email campaigns have evolved over the years, and now not all of the random messages get filtered into the Junk folder. It is quite often that spam email messages land into your main inbox because they look like notifications from legitimate service providers. For instances, sometimes users confuse spam email messages with invoices from online stores. Of course, if you have not bought anything lately, you should recognize the scam immediately, but if you see a familiar name, you might think that you have simply forgotten your newest purchase. Needless to say, the attachment will not look like an executable file. It will probably have a document extension, and it will trick you into opening it. However, once you launch that file, you will initiate the KoKo Locker Ransomware installation on your computer. First, the ransomware will scan your system to see where all of your files are located. It does not encrypt every single system file (luckily). During our research tests, we have found that this program encrypts picture and document files you keep in your main default folders. After the encryption, all of the affected files will have the .kokolocker extension added to them. Needless to say, you will not able to open any of the encrypted files because the information in them will be scrambled and the system will not be able to read them. All of your personal data got encrypted by KokoKrypt! Payment may be delayed for 24/48 hours, so don’t worry! You have 78h to pay! 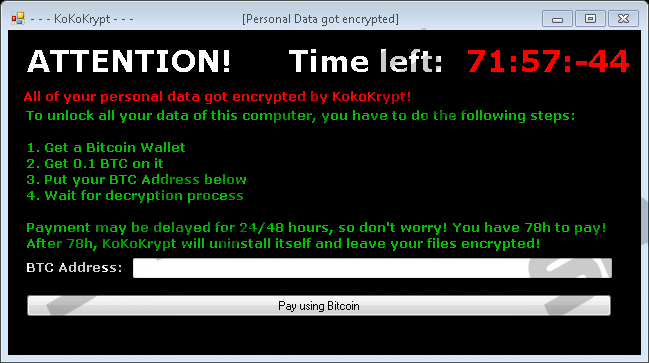 After 78h, KoKoKrypt will uninstall itself and leave your files encrypted! As you can see, this infection gives you limited time to purchase the decryption key. Also, please note how it says that the payment process might be delayed. The point is that the connection between this command and control center and the infection on your computer might be unstable. Sometimes it gets severed altogether, so even if you do send the payment (0.1 BTC is approximately $95USD), the criminals may not receive it. Consequently, you would not get the decryption key that would help you restore your files. Unfortunately, there is no public decryption key available at the moment, but you may not even need it if you have a system backup. What we have in mind is either an external hard drive or some cloud drive where you keep copies of your files. What’s more, maybe most of your frequently used files are saved in your inbox? Either way, please consider all the potential options because you might be surprised to find just how often to make backup copies of your files. You can delete the infected files and transfer the healthy copies back to your computer after you remove KoKo Locker Ransomware for good. The manual removal is not complicated, although most of the ransomware files may have random names. Either way, once you are done with the ransomware removal, do not forget to scan your PC with a security tool that would confirm whether your PC is safe and clean. Afterwards, you should also invest in a licensed antispyware application to protect your system from harm. Open the Processes tab and end any suspicious/unfamiliar process that you see. Delete all the randomly-named recently download files. Quick & tested solution for KoKo Locker Ransomware removal.